Celeb Gossip News – Grammys 2019 start time: What time do the Grammys 2019 start tonight? The 61st Grammy Awards are taking place tonight (Sunday, February 10) in America. The show will be broadcast on US network CBS, which is also behind the likes of NCIS and The Big Bang Theory. Musicians including Lady Gaga, Drake and Childish Gambino will be arriving at the Staples Center in Los Angeles for the glamorous ceremony. What time do the Grammys 2019 start? Officially, the Grammys kicks off at 3:30pm ET/12:30pm PT in America with fans able to watch the event on the organisation’s official website Grammy.com. Due to the time difference, this is 8.30pm GMT in Britain for those hoping to watch some of the ceremony. However, it appears that only those in US will be able to watch the ceremony on Grammy.com with no live broadcasts in the UK. It Wasn’t Me pop star Shaggy will be hosting the start of the Grammys when the first awards will be given out as the show kicks off. There will be performances from Ángela Aguilar, Natalia Lafourcade, Sofi Tukker, along with others. WHY IS ARIANA GRANDE NOT PERFORMING AT THE GRAMMYS 2019? Again, the red carpet can be viewed on the Grammy website for those in the US, while viewers in the UK can watch it live on the Grammy Facebook page. British viewers can also watch the red carpet on E! with presenters Giuliana Rancic and Ryan Seacrest speaking to the nominees ahead of the ceremony and the all-important results. Once the red carpet has wrapped up, the Grammys 2019 will be broadcast live across America on CBS tonight at 8pm Eastern Time and 5pm Pacific Time. In the UK, this is 1am GMT on Monday, February 11 due to the time difference. British channel 4Music will be showing highlights from the Grammys on Monday, February 11 between 7.30pm and 9pm. 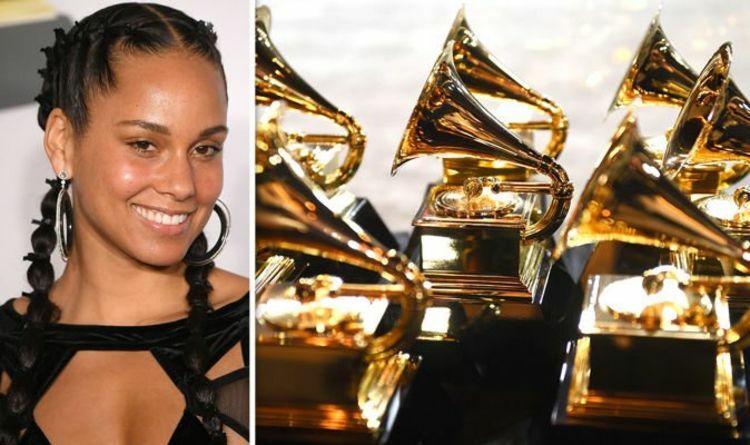 Alicia Keys will be hosting this year’s Grammys ceremony, which makes its return to LA after taking place in New York in 2018. A total of 84 awards are going to be handed at this year’s Grammy Awards with the biggest categories getting announced towards the end of the evening. Fans of the Grammys can also keep up-to-date with the ceremony on social media via the music academy’s Twitter, Facebook and YouTube accounts. There will be a whole host of performances to keep the audience entertained this year from the likes of Cardi B, Miley Cyrus, Shawn Mendes, and Red Hot Chili Peppers, among others. Music legend Diana Ross is going to be performing this evening with the Recording Academy honouring the star’s musical accomplishments with a special award. Lady Gaga will be attending the event after it was revealed she would not be attending the BAFTAs 2019 which takes place in the UK this evening as well.